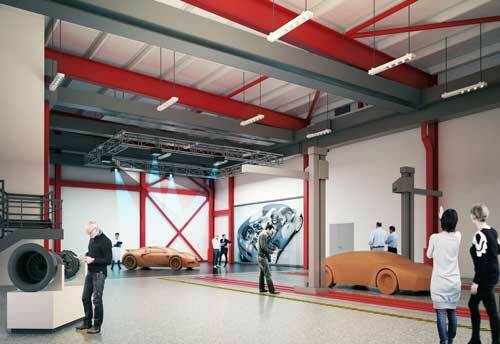 Work is underway on Coventry University’s multimillion pound National Transport Design Centre, which is being established to boost design innovation in the sector and bridge a shortfall in creative skills. The centre will feature a six metre power wall allowing designers and engineers to explore transport concepts in virtual reality, and will also have projection mapping technology to enable intricate digital designs to be cast onto 3D surfaces. Students, researchers and transport industry professionals will also be invited to access the latest clay milling facilities for creating physical models of vehicles as part of the design process. An initial £7 million contribution has been made to the new centre by the Coventry and Warwickshire Local Enterprise Partnership (LEP) and the government’s multimillion pound Local Growth Deal. Kier Construction and architects Glancy Nicholls are working together on the project, and it is anticipated the centre will be complete and ready to open its doors to support businesses in the transport sector in 2017.